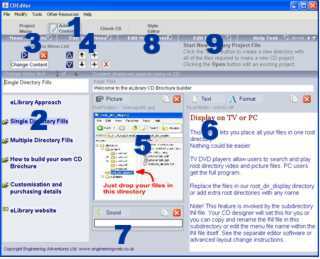 Select the 'Add Content' button (1) to modify the content of the CD. Your content will be stored within different module directories within each project directory. The module structure determines and defines the structure of the program although the CD editor creates this automatically. You can change the current module directory by clicking on the menu contents list (2) or arrow style navigation buttons (3). These navigation buttons also allow you to add, move or delete menu items (4). To change the text in the contents list simply click on the contents list line that you want to change, then change the text in the edit box above (2). The contents.rtf file can also be edited in any word processor although we recommend Word Pad not MS Word. With each line of the contents list (2) you can add text, picture, or sound to clarify what is contained within the next section of the program. Items are added by clicking on the relevant buttons that appear when 'Edit Menu Items' (8) is openen. Content can also be moved around or deleted etc. (6) for text and (5) for pictures. The pictures can be added as one that will appear for every content line (global) or only at one particular line. Also thumbnails can be added as active menu links. Double click on the contents list (2) or click the 'Edit Content' buttons (3) to add content to appear at that menu list item. Presentations, Web, Adobe, PowerPoint, Word, Excel or additional menu lists can be added by clicking the relevant button. You can change the frame title by editing the text below (8 and 9). This will remove the dvdcatalogues title. An unlimited number of different window layouts are possible by including different subapp windows (9). The demo carries a limited range of subapps although more are available with the full version and we can produce any custom layout if required.